Scroll to the bottom of the page, for the Jam Tracks. Starting on the 6th string (low E), look at the first three dots. They are G,A,B. Then the dots on the 5th string are C,D,E and finally, the dots on the 4th string F,G,A. You can see that they are alphabetical. Now, remember that the notes in between are the sharps and flats. Also, starting at the twelfth fret, all of the notes start over. So, right off the bat, you now know most of the notes on the last three strings. Using octaves, we can get the notes on the 3rd string. Remember that an octave is "up two strings and up two frets" (Or in reverse "down two strings and down two frets). To find out what a note is on the third string, 5th fret (for example), you would drop down two frets (to the 3rd fret) and two strings (to the 5th string). You can see that, using the dots, it is a "C". There fore, your note on the 3rd string is also a "C". Once again, match these notes about the twelfth fret to double your knowledge. Then, remember that the first string is the same as the 6th string. This gives you most of the notes on the neck, at a quick glance. This is the common "Do re me fa sol la ti do" scale. Use over Country, Blues and Rock with Major chords. The flattened 7th and 3rd give it a Minor sound but the raised 6th add a jazzy feel. A minor sound with a more exotic feel due to the flattened 2nd. Commonly used in Metal. A Major sound but made a little more exotic because of the raised 4th. Think Steve Vai. This is a great scale for dominant and dominant-7 chords. Great to use after the pentatonic blues scale to add a cool jazzy feel. This is the minor scale. Don't leave home without it! I explained in my other thread how the Major scale is constructed. You know that already ...do-re-mi-fa-sol-la-ti-do. Play it from Do to Do on your guitar. Go from C on the 8th fret 6th string to C on the 10th fret 4th string. That is the Ionian Mode of the major scale. Now play from Re to Re. D 10th fret 6th dtring to D 7th fret 3rd string. That is the Dorian Mode of the Major scale. Now play Mi to Mi E 7th fret 5th string to E 9th fret 3rd string. That is the Phrygian Mode of the Major scale. La to La is the Aeolian Mode and Ti to Ti is the Locrain Mode. Notice that each one has a subtle but distinct sound as you go from the first note to the last note. Think of each of these modes as it's own scale with 8 degrees from Root to Octave. You now can see how each of these modes relates to the chord found on the degree of the scale and on the guitar it also relates to the pattern or box shape that results from each beginning note of these modes. And of course these are moveable shapes up or down depending on the root you want. When learning these patterns, keep these things in mind. First, learn the Ionian and the Aeolian (relative minor scale). If you have the above modes down, knowing their 1/2 step and whole step intervals, the rest of the modes are a lot easier to know as they are just variances of these two. For example, knowing that the Ionian has half steps between the 3-4 notes and the 7-8 notes, you can see that the Lydian is like the Ionian except it has a raised 4th (making the half step between 4-5 instead of 3-4). The mixolydian is like the ionian except it has a flat 7th. This mode is sometimes called a dominant mode because the 1-3-5-7 make up a dom 7th. The dorian is like the aeolian except it as a raised 6th relative to the aeolian. The Phrygian has a flat 2 relative to the aeolian. The Locrian has a flat 2 and a flat 5 relative to the aeolian. It's 1-3-5-7 notes make up a half diminished 7th or a min7b5 chord. So what I'm getting at is if you learn two important modes within the major scale, you can derive the rest of the modes if you know the relationships. I'm currently using this scheme in learning the harmonic minor modes and melodic minor modes. This is the guitar scale to learn. Start here! The natural Minor scale with a raised 7th. The Blues Scale with an added, Major 3rd. Because of the Major 3rd, flattened 7th and flattened 9th, it works well over Dominant-7 chords, sharing the same root name. It also works over a Diminished scale. A six note scale, constructed of whole steps only. Try it over dominant-7 chords and Augmented chords. Adds the flattened 5th for colour. Also known as the "Whole-half" scale. Sounds great over Diminished-7 chords, Dominant-7 chords and Minor chords. Q: IF Eb is I then what are II III IV V VI VII? lot of ways, such as identifying any interval and spelling any chord. Naming chords has two aspects of it. Looking at the chord "statically" and looking at the chord in it's musical context or where it was coming from and where it is going. First and most easily you look for stacked thirds. If you are in the Key of C, don't think C D E F G A B C, think C E G B D F A C.
If you see these notes in a chord: B D G D, and you need to name it, rearrange the notes into stacked thirds. The B is a third below D (see the rearranged C scale above), but the G is a third below the B, So re-spelt in ascending thirds the chord is G B D with the other D just being a doubled note and for naming purposes is ignored. F# B D G stacks up the same way with the F# as the Major 7. Why major or minor. Compare C E G, and D F A. IT is two steps from C to E but only a step and a half from D to F. This shows the two kinds of thirds, the "minor" is a step and a half and the major is a step. So a chord (or a triad) is either major or minor based on the first third up from the root. In the major scale the funny thing is as you stack up thirds "twice" to get a full triad or a chord, we get root, third fifth. Ok that isn't funny but the funny part is in the seven chords we have in any major scale, the "fifth" is always the same distance from the root except in one case (the B chord in the key of C, and similar "vii" chords in any major key). That root and "perfect" fifth is your power chord. The fifth above B in the key of C is a half step short of a perfect fifth (the "Tritone" or three full steps up from the root, built by two minor thirds). The perfect fifth is built up from the root via an minor and a major third stacked on top of each other or a minor and a major stacked on top of each other. What is a dominant? If we stack another third on these triads we find another funny thing. Each time the minor triad gets another third stacked on top if it, you get a whole step below the root of the chord. D, F, A, C and your just a step down from the octave from the root of your chord which is a D minor 7. E G B D and you get an E minor 7. A C E G and you have an A minor 7. Two of the three major triads yeild a major seventh C E G B and F A C E are both major seventh chords. The G major triad has a problem. It is Forced into the same problem that the B triad in C has, that going up from B to the fifth only gets you a half step short of the perfect fifth. G B D F is a major triad with a "minored" seventh. We call this the "Dominant" seventh chord. WE call it that because G is the Dominant of C. Now that we talked about the name of chords statically, we get into their "functions". Each chord has a job. You can tell what a chord is and how to name when you see the job it does. Music has meaning, that meaning comes from the directions the notes move in and the directions they want to move in. Getting into chord functions can get deep-- and long as in how much typing most be done. in C we have seven chords. C major the I or the Tonic, this is home. It is a good place to start and when you return to it, it should sound like you finished a paragraph in an essay. G the Dominant. When playing in C and you get to a G, there is often a hightened tension, and specifically it is that the B wants so badly to slide up into C (home) and the D wants to slide up into E the third of C or down to C (home). How you build to this tension and resolve this tension is what music is all about. The F major is called the subdominant. It is a tranistional chord. It doesn't sound like C or feel like it but it isn't creating any tension so much that needs resolving. It most often leads to a dominant chord. the D minor similarly subs for the F major. I blues we have I IV V and in jazz they talk about ii V I. The E minor subs for C also, it is essentially a C major 7 without the root, and so it functions the same way. It feels almost like home. A chord change of C maj, E minor, C major, A minor, C major is like no chord change at all. The B chord is inherently unstable, is screams for resolution. That "diminished" fifth, a half step short of a perfect fifth is harsh. It is so dissonnant to the uninitiated ear that it represents the furthest from "home" we can get. It's dissonance is the reason we play a G dominant 7, we want it to really drive home the resolution or the return home. IF we can add the 7th to the G chord, and we can talk about major and minor seventh chords, we can add more notes to chords. The more we add and the more we leave out from what we have available to any chord, the more complicated it gets. At that point it often makes more sense to look at what the chord is doing and where the voices are going than it does to just look for stacked thirds. Ab, F, B, Eb may look like it is ... well a mess but it if you see it change into G E B D you might see it as a G dominant 7 b9 #5 changing to a C major 9. No roots at all in either chord, but I'm going by the "function" they are serving. Pulling an abstract example like that is not showing the context, but for now if you don't get it just trust that apparently odd chords like those could and often do function as I describe. Real complicated naming of chords by function will have be for another time. It only really matters for analysis or for playing jazz. The 1st, 3rd and 5th notes are C, E and G. There for the C chord is CEG. The E note is the one that was the third note in the scale. As I mentioned, you need to drop the third note to create a Minor chord. We only want to drop the note a half step (or one fret). And voila, you have a C Minor. In that example, we dropped the A on the G string down to an open G. This gives us the 7th sound. It always sounds better to drop a higher root then a lower root. You may also combine rules to create new chords. For example, the minor seven chords. So C Eb G Bb is a "C Minor Seven". There are similar rules for the other chords as well, but this should give you some great tools for starting out with building chords. 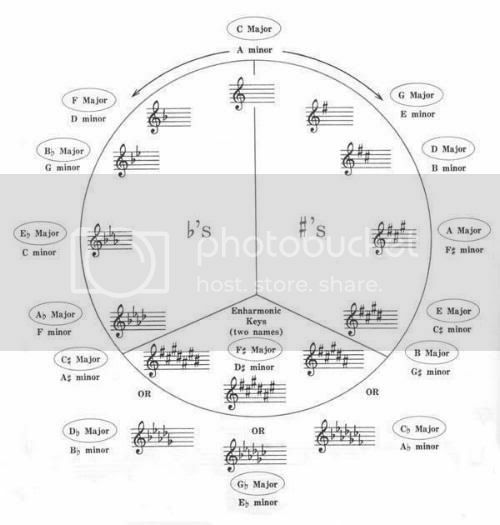 Once you start "useing" the circle of fifths, you'll never stop using it. It reaches into so many aspects of music. As said above, you can see how many sharps a sharp key has by how many fifths the tonic if from C. G is one fifth away from C, and has one sharp. D is two fifths away from C and has two sharps, the F# retained from G and C#. The "new" sharp is always the seventh or leading tone of the new key, and the previous sharp is a fifth down from that making it the third from the new tonic. (When we go to flat keys it works differently, but we'll leave that alone till someone askes about the cycle of forths). As you play chord changes through a cycle of fifths, the third becomes the seventh. So if you play a G7 and change to a C7 the B in the G becomes the Bb in the C7, and the F in the G7 becomes the E in the C. These two voices (a tri-tone apart) move down a 1/2 step or one fret through the change. This cycle can continue endlessly and you can slide down a fret holding a tritone shape for each change through G7-c7-F7-Bb7-Eb7-Ab7-Db7-Gb7-B7 (Cb enharmonically) E7-A7-D7-G7 etc. All twelve dominant chords were played and all twelve tonal centers were "implied". Cycle of fifths is also used to understand what "key" is implied. If you see: G min 7 -> C 7 -> F min 7 -> Bb7 -> Eb major, you could see it as being in F major during the G min and C 7, and then changing to Eb major when the F minor kicks in. Some see the reason why a forth or "natural 11" is such a bad sounding note and the "avoid" note. If we stack fifths over C we get: C, G, D, A, E, B, F# (!) , C#, G#, D#, A#, F and finally back to C. If we are playing a solo or if we are randomly picking notes to play in a chord when we see C Major on a chart. This list is more useful often than say a list of just the notes in our parent key and even more useful than that list stacked in thirds. Let's compare this list of perfect fifths from C to the C major Scale, we get C D E F G A and B. If we put in a stack thirds kind of list we get C E G B D F A and of course none of the sharps. In virtually no circumstance is the F a useful note when playing over C major, it trys to take over as the tonic-- not so coincidentally the F is the last note arriving in the stacked fifths. Just as above we say G (with our without the "7") points to C, C points to F. Playing an F only emphasizes that "pointing" aspect instead of reenforcing it's status as tonic. IF we look at the stacked perfect fifths we see a whole host of notes we'd use before the dreaded F. It also explains why we see so many sharp 11 chords, sharp 9, flat 9 and even some sharp9/flat 9 in the same chords. Another interesting thing about the stacked fifths is that it has been used by some to explain the amazingly great sounding pentatonic scale. C G D A E are the first five notes we get in our stacked fifths. It is the C major pentatonic scale. I think that is pretty cool. From a purely theoretical standpoint, inversions are simple to explain. An inversion just changes the order of the notes in a chord -- from lowest to highest pitch -- in a specific way. To invert the C major triad, we move the C -- the root -- up an octave, giving us E G C. Now the E -- the 3rd -- is in the bottom or bass position. We can invert the triad again, raising the 3rd up an octave, too. In this example we'd have G C E, with the 5th (G) now in the bass position. The first example of inversion is called -- ta da -- first inversion (E G C). The other, G C E, is second inversion. If we try for a third inversion with a triad, we end up where we started, C E G, or normal form. With 7th chords, there are four pitches so you can have a third inversion. Now, from the "chord naming" discussion, it is possible that the same notes used in an inversion can also name a different chord. For example, Am7 in first inversion is C E G A, which is also a C6 chord. So, which is the proper notation for those notes? It depends on how they are being used in the song. So, the next time you see a TAB or sheet music with guitar chord symbols, and you see the fingerings for a C6 chord but it is labeled Am7, you'll know it's not a typo but really Am7 in first inversion. In a more general sense, a voicing is a particular arrangement of chord tones. Inversions are a kind of voicings. For the C6 chord, maybe the 5th isn't played by the guitar -- C E A -- but by another instrument. At that moment in time a C6 is being played by the ensemble, but the voicing given to the guitarist is C6(no 5). If you're looking at a score you'll probably see C6. If you're looking at just the guitar part, it may say C6(no 5) or may still say C6 and give the voicing with a guitar chord symbol. Scales, Modes and Arpeggios. 1MB. Now, think of the A and B strings as the "Outside two" and the D and G strings as the "Inside two". repeat right away. ie. don't leave a pause here! Once you get this down, you can try other patterns. Later on, when you go to learn a song, you will see that you already have the dexterity from all of your practise and you won't need to rely on patterns as much. This means you can tackle the more advanced stuff like, classical pieces that don't have set patterns. Granted, this is only the first step in learning how to do it and not the way all finger picking is done. Finger picking is about gaining dexterity in your right hand. Much the same as you had to go over chord changes and scales to whip your left hand into shape, you must practise picking with the fingers on your right hand to help them act individually. Hold down a "G" chord. Play the same pattern, but, the first hit with your thumb will be on the "A" string, the second on the "E" string the third is back on the "A" string etc. Then, you can try alternating the index finger between the "B" string and the high "E" string. Also, try simple rolls by doing a thumb, index, middle, ring, middle, index, thumb. You can also add the pinky on the high "E" string, into this roll once you get the simple one down. Lastly, adding an alternating thumb. All of these exercises will help strengthen your dexterity and aid greatly in being able to finger pick the way you want. This section contains the links for all of the jam tracks that are currently available. When you have added your solo, feel free to post it in the "Post Jams Here..." thread by clicking here. These are free to use, but you may not sell them or use them as part of your own arrangements. In other words, download, jam along, have fun, but don't steal or use for monetary gain! If you'd like to add a backing track, please PM me the link for the song location (Not a link to the song itself) and I will add it. Thanks to Fumblyfingers for starting this idea up. There is an E Minor track on the Jam Tracks page and an A Spanish Gypsy on the Exotica page. Millo stated in another thread: "Personally, I'd like to have a go-to list of electric guitar models for when students ask what to buy." This is a great idea. I thought that if we had a list of the best guitars you can buy, at each price point, it would really help potential buyers. So, what are the best guitars at each range? It's ok if there are a few in each catagory (gives more choices), just as long as they have been tried and tested and found to be good. Let's get a list together that can be added to the Tutorial section. If you have a guitar that you would recommend to someone, then post the brand and price and I will add it to the list. Check for fret roughness on any guitar you are considering! Take a knowledgeable friend along if you can. Try to avoid really inexpensive models - they're cheap for a reason, and pretty much anything under $200.00 new is a project item for a skilled person, but nothing but trouble for a novice. Of course there are exceptions, but a novice usually won't spot them. Pay a bit more, and get a well made, well finished guitar. You'll go a lot further with it. Anything made in the newly industrialized countries in the Far East is still a crap shoot - quality control is still very iffy. They'll get better in time, but for now, I suggest letting someone else serve as the developmental Guinea pig, unless your in-the-know bud spots a diamond in the rough for you. mdrs' Battle of the Wahs! I've seen several threads asking for info/advice on which wah pedal to purchase. There has been a lot of good info in those threads. I thought I'd post sound clips of eight different Wah Pedals so that we could all do a sort of aural comparison of them. I played two simple licks thru each pedal. I played my home made Tele thru each different pedal, then thru my Fuchs ODS 30 2x12 combo, and recorded it on my Digi/protools setup. I purposefully did NOT mention which pedal is used on the clips on the soundclick site. I'd suggest you go to the link, and listen to them all first WITHOUT LOOKING AT THE LIST BELOW!! That way you can do a real "blind" evaluation and comparison, with out any preconcieved bias. The adjustable pedals, such as the 535Q, and the Dimebag camo, are set to where I personally liked the sound best. This is very subjective, but I couldn't set it to every setting....Also, I used the factory pre set on the Bad Horsie 2 (i.e. I didn't record it using the contour settings). For what it's worth, I've owned two Dunlop Crybaby Classic Fasel Inductor Wahs, but the potentiometer failed in each within weeks of buying them (loud scratchy sound), so I returned both.